You may have heard the whispers. It is getting louder but I’ll get to that in a second. 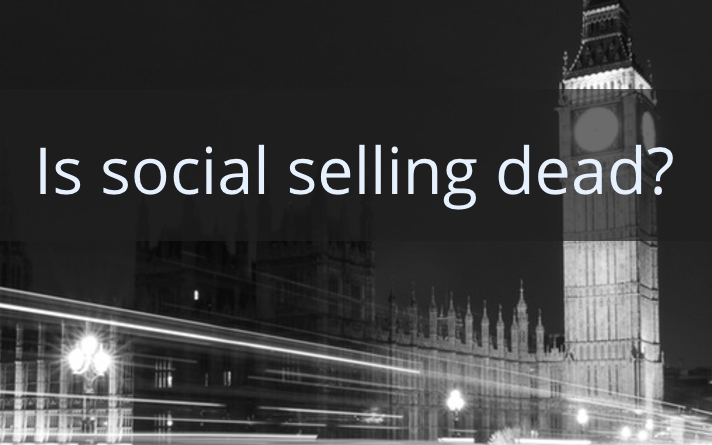 The idea that social selling is dead or dying is a bit over exaggerated. ** Note: This is the longest post I have written on Linkedin. Even after editing, I wanted to make sure that I addressed all of the points I felt necessary. Gabe Larson wrote a post recently on how social selling is dead, I just saw it. It has some interesting stats in it and a few lines that I agree with but many that I don’t. I’ve pulled from his post and note it with italicized font. First, before we walk down my opinions, let’s define cold calling. Ok. Now let’s break it down. Cold calling should be dead but I come across companies every year that still rely on it. Now it’s not as bad as handing out phone books to sales people but they have done the digital equivalent and handed a sales rep a CRM full of names that were bought from a vendor who match some of the ideal customer profile. Now the confusion is if “cold calling” as defined above is dead. I would argue yes 99% of the time. Most cold calling experts don’t even rely on REAL cold calling anymore, they promote a more blended approach that still leans towards more phone calls, and yes, all of them use social media to some extent to sell their ideology. Which I see as ironic but I don’t want to discourage them from being successful. Do I think that social selling is the end all be all? No. I’ll write that more clearly. Social selling alone is not enough. I define social selling as Leveraging your professional brand to fill your pipeline with the right people, leading with insights and building stronger relationships. It’s not the only play to run but it needs to be part of your playbook. The word “social” or even “social networks” doesn’t get mentioned in the definition. Is that weird? I don’t think so, I think it identifies that it is more about how you are recieved, viewed, branded if you will than it does the medium. But the medium is important. Social networks are the ultimate equalizer that can make small companies look like empires and give the average person a platform to potentially touch millions. Shouldn’t it just be called sales? Probably. Is digital marketing just marketing at this point? Yes, for the most part. We give it a special moniker because it’s new and a speical focus should be given to it in order to explore and define it further. I wouldn’t bet on creating a social profile to get my first million-dollar deal, nor would I bet on blasting out 1000 random emails, or blindly cold-calling prospects off an unknown list. Sales, and especially prospecting, is and will always be a combination of QUANTITY, the number of activities and the type of activity and QUALITY, the depth and personalization of each and every interaction. This is valid , a bit extreme but valid, but what concerns me most is that “blindly cold-calling prospects off an unknown list” is what many people would want sales leaders to believe is the right process. I think this should be absolute last resort and is the sign of a desperate sales force. I also find it concerning that a company would buy an auto-dialer product so they could systematically call 100 people at once and then connect you when someone answers their phone. That’s ludicrous and yet there are companies that buy products like this too. Personalization is key. Being human is key. What are the chances that you can be personal or remotely human when a machine connects you to the first person that answers their phone, giving you maybe 3 seconds to know who you’re connecting with. I bet its low. I don’t want to attempt to speak for all thought leaders but NO. I wouldn’t think this is the case and I’ve always been skeptical to say they should. The truth is, most salespeople shouldn’t be writing. Have you read some of the emails from salepeople, they are sad. So asking someone who can’t write a decent email to become a blogger is a leap. Now, I have come across many talented salespeople who DO know how to write well, and to them, I say go for it. Maybe writing isn’t your thing, maybe you like video. You can create videos. Look at what Morgan Ingram is doing and tell me that’s not building his professional brand and leading to sales opportunities. I can also say that not everyone should be creating content, but everyone should be sharing and engaging. Now should salespeople be managing social networks? YES! What could be better for helping build a professional brand and providing value to potential buyers? Personalization is key. Being human is key. Social networks power the human connection. Over the past 5 years there are two main confusions about social selling, one is propagated by the sales training community or auto-dialer companies that have built their entire careers on the ‘cold calling’ methods of yesteryear and the other is that “what social selling is”, has not been consistently defined, and a lack of clarity is one of the most confusing things ever. Do cold calling thought leaders think that an auto dialer and a script is an effective use of time? IDK, I will wait for them to comment on this. Now, I don’t know about you but this actually annoys me. It’s deceitful and I would also say it’s fraudulent to start off a relationship with me by making me think you are calling me from next door when you are actually calling from across the country. Maybe it’s petty but if you need to trick me into answering my phone by making me wonder if my kid’s school is calling me or someone I know, but don’t have their number saved in my phone is trying to reach me, then I would call that a petty attempt to interrupt my life. Now this may be true but marketing has many jobs, so I’ll focus in on the demand generation side of a Marketing Dept, it’s their job to drive leads, nurture them and then qualify them enough for a salesperson to get in contact. As we all know, marketing doesn’t produce gold all day long. They have a formula they are trying to optimize. Let me over simplify it. So if you need 100 new leads to convert at 20% to get 5 new sales opportunities and you’re tasked to get 50 new opportunities a month, they have to build a machine to get up to 1000+ new leads a month. Even with the simple math, the importance of salespeople to continue generating their own leads and pipeline is still there. I continue to hear that salespeople need to produce upwards of 60-70% of their own pipeline. Is that marketing’s fault? Maybe, but I’ll get to that in a second also. Let’s believe for a moment that it’s a fact and salespeople need to drive their own pipeline. How are they supposed to do that looking at the information available? 75% of B2B buyers and 84% of C-level or vice-president level executives use social media to make purchasing decisions. Why is this confusing? If buyers are trending in the direction of looking online for products and services, doesn’t that lean toward salespeople operating in those ecosystems also? There are many stories of how social networks played a major role in a salesperson’s or company’s successes. • A 2012 Harvard Business Review article reported that 90% of C-level executives NEVER respond to cold calls or e-mail blasts. • An IBM study found that cold calls are ineffective 97% of the time, and this number has been increasing by 7% every year since 2010. • PipelineDeals even reported that InMail beat cold calling by 30X. What stands out time and time again is that salespeople who took control of their pipeline and started learning from advanced sales and marketing tactics excelled. Salespeople started leveraging other tools than just phone and email to connect to buyers. That’s smart in my book. So, is it Marketing’s fault? I am going to get a few haters for saying this, but yes. It is. Sales and Marketing should speak a common language. In many cases, marketing teams have been hiding behind the “new lead” wall for far too long and running away from any conversation that says they should be tied to revenue goals. Marketing teams like to focus on branding and awareness but do not want to be responsible for sales. To be fair, they should not be responsible for sales, but they should be more responsible to empower the company to drive more business by tracking as close to revenue as possible. This is why platforms that empower employees to share content like Hootsuite Amplify are growing in popularity. It’s the lowest barrier to entry in a larger program to enable social selling activities to help employees have an active voice and customer facing employees an opportunity to listen and engage with value. That drives revenue. Salespeople have been shackled over the years. Tied to archaic methods and now they are breaking out into new tools that should enable them to have more scaled communications and connect with more people. Look at the growing list of companies like LeadIQ that builds highly accurate email lists, or SalesLoft that lets you execute on a cadence of phone, email, and social communications so you can convert more target accounts, or Cirrus Insight that creates powerful Flight Plans consisting of sequences of emails, calls, and follow-ups with your CRM. The tech stack in sales is exploding. Companies and marketing teams should be training the sales teams how to use these tools to be more effective. Sales tech is advancing quick. Platforms that were once only seen as products for enterprise marketing teams are making their way into sales teams. The biggest gap is giving the best tools and training to your salespeople to operate them effectively. Social selling is not dead, it’s still getting momentum and it’s evolving into even more creative ways to connect and engage. Visibility creates opportunity. In all forms.